When’s the last time a client had a hard time articulating what they need or want from you? When you’ve been doing what you do for some time, you might just assume you know based on your prior experience with other clients. However, when you assume, you may completely miss the mark. Yet, when your client can’t articulate what they want or need, what next steps should you take? Being able to help your client uncover their wants and needs is very much a part of the sales process. Often clients are able to tell you what they don’t want. Telling people what you don’t want is a common way to speak in our society. People often tell me they don’t want to come across as salesy. Maybe your clients tell you they don’t want to make the wrong first impression or they don’t want to waste money investing in the wrong real estate, etc. There’s a myriad of things you can insert for people’s “don’t want”. Some people might assume that if someone doesn’t want to be salesy, they want to be confident. Others might assume the person wants to not sell at all. A few might even assume the person wants to educate people vs. selling people. Whatever the assumption is, it’s still just a guess. Until the client tells me what they want instead of being salesy, I don’t actually know. Now based on my years of working with people, I might guess the right answer. However, guessing is not what the client is paying for, they want a real solution to their problem/need. This same example works for your clients as well. For those of you making assumptions, my may be leaving people feeling unsatisfied when working with you. You may not actually be meeting their needs and solving their problems. The solution is found when you can help your client articulate what they do want. In order to do this, here’s a very simple, yet powerful question to ask your client: ” If you don’t want (insert their “don’t want”) what would you like to have instead? The answer the client gives to this question is what I call a Gold Nugget. 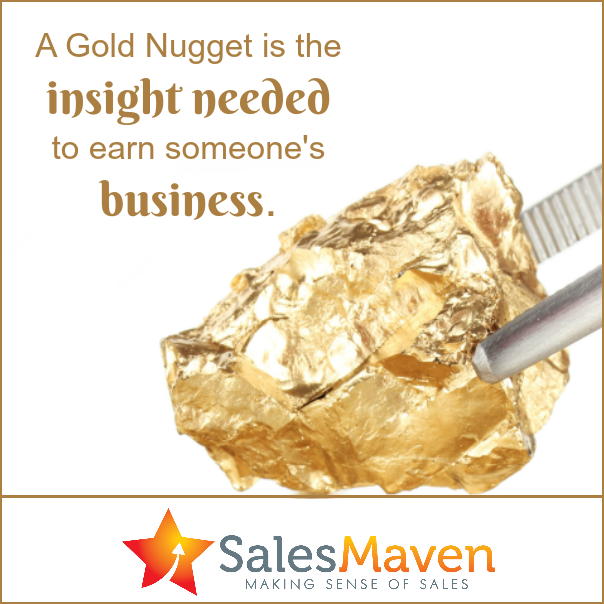 A Gold Nugget is the insight needed to earn someone’s business. When I demonstrate how I’m able to give them what they do want, I’ve increased my chances significantly of earning this person’s business. The same holds true for you as well. This means you may need to take a few extra steps in the selling process and help people articulate what they do want. Without knowing this, you’re basically playing a guessing game on how to earn someone’s business.